Welcome back, mountain lion: Is the Northeast ready for predators? The headlines were shocking enough to rattle even the most hardened suburbanite: A mountain lion, it seemed, was lurking in Winchester. Police in the quiet community north of Boston were convinced of it—convinced enough to warn residents with a reverse 911 call. And just like that, across town, a new fear was born. Mothers and dog-walkers began scanning the horizon for a predator. 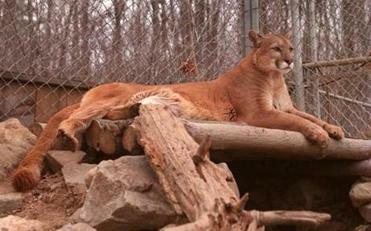 French doesn’t believe a mountain lion, also known as a cougar, is stalking Winchester. The evidence, he said, leaves “absolutely no uncertainty” that the mysterious animal leaving tracks in the snow recently is either a coyote or a dog. But the possibility is not the stuff of myth: Mountain lions and wolves—large predators—are indeed starting to make inroads into New England. “They really are here sometimes,” French said. And experts believe that within a decade or two the animals, which disappeared from Massachusetts more than 150 years ago, could be back in much larger numbers. 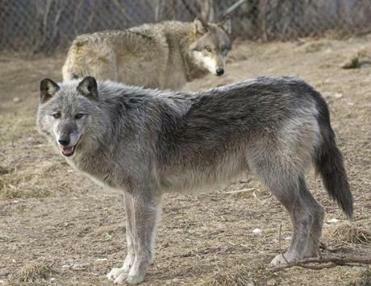 At least one gray wolf was reported stalking sheep in Massachusetts. 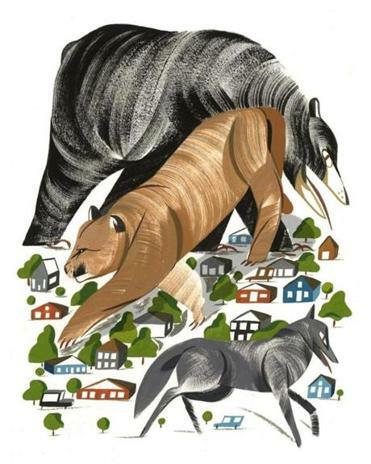 Learning to coexist once again with long-vanished wildlife isn’t a new issue in New England. In recent years, Massachusetts has seen an explosion in the populations of beavers, turkeys, deer, and bears, creating a host of problems: beaver dams flooding neighborhoods, turkeys chasing pedestrians, deer scampering across highways in the night. But the return of mountain lions—animals known to kill pets, livestock, and, on rare occasions, even humans—is something altogether different, an event that would surely change the way we walk through the woods and play in our yards, if nothing else. In the beginning, early settlers in New England faced plenty of dangers. No one can say for sure just how many mountain lions or wolves were prowling the forests at the time. But they were here, said Marion Larson, the chief of information and education for the Division of Fisheries and Wildlife. Colonists didn’t like them. And she can pinpoint exactly when they were killed off in Massachusetts. The wolf was a problem as early as 1630, when, according to historical records, officials started paying people to kill them. By 1750, wolves had been eradicated from eastern Massachusetts. And less than 60 years later, the state was down to just two—a pair of lone wolves, records say, ranging from Amherst to Montague, until, inevitably, they too were killed in 1805. A mountain lion visited the Quabbin Reservoir area in the late 1990s. In the Midwest, it’s already happening. Populations of mountain lions are growing and creeping ever eastward—into Nebraska, Missouri, and Wisconsin, a state that until recently hadn’t recorded cougars in more than a century. “They’re only rarely getting this far,” French said. Still, occasional cougars from points west are beginning to visit the area. State officials confirmed the presence of a mountain lion near the Quabbin Reservoir in the late 1990s. More recently, in 2011, a mountain lion roamed Connecticut before being hit and killed by a car. This was no exotic pet: Genetic testing showed the 140-pound cat had traveled 1,500 miles from South Dakota. And on at least one other occasion in recent years, there were reports of a different predator stalking sheep in Western Massachusetts. “Lo and behold, this wasn’t a 50-pound coyote,” French said. It was an 85-pound gray wolf, proving, yes, our habitat was back, all right. 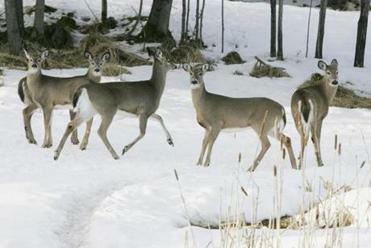 An 18-fold rise in the deer population has “set the table” for predators. One solution, French suggested, is education. Wildlife officials routinely give talks across the state, teaching people how to live with the animals in their neighborhoods. Maybe it’s time, French said, to develop a talk on mountain lions—even if they aren’t yet here. But he admits that talks alone aren’t likely to put people at ease. The potential return of mountain lions comes at time when many people live in a way that’s largely disconnected from nature. Those who do enjoy the outdoors venture into the New England woods knowing they are mostly safe on their hikes. For many decades now, there have been few creatures out there with any potential to threaten us, aside from deer ticks, perhaps, and bees. Charney counts himself among those lovers of the outdoors. He lives in Sunderland, Mass., and enjoys taking walks in the forest at night. He says he’d still do it if mountain lions were here. Freelance writer Keith O’Brien is a former staff writer for the Globe and the author of the book “Outside Shot,” chronicling one town’s lonely quest for basketball greatness. E-mail him at kob.story@gmail.com.